This drawing was commissioned by a department at CBS. When I got the call I was sure that I did not want to do a commissioned drawing. We ended up meeting and I agreed with some reservations. I was fine with the fireplace, tree, and logos. 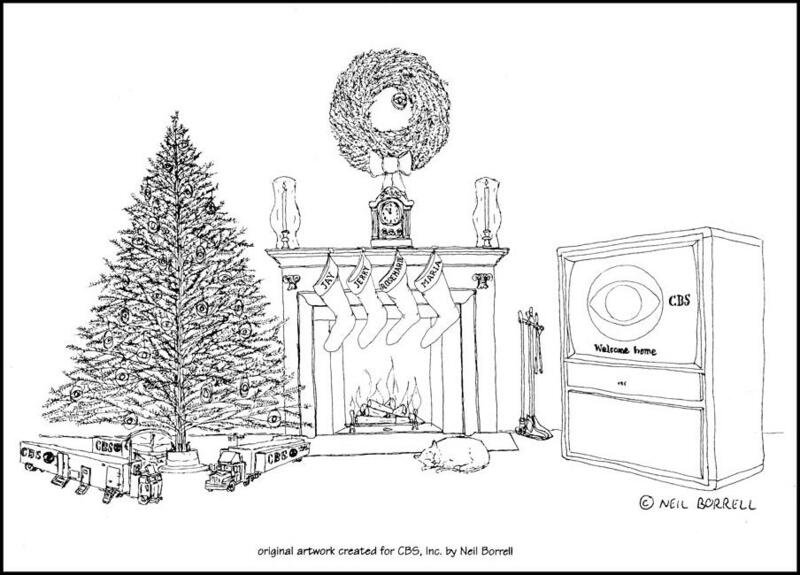 I even liked the idea of CBS remote trucks under the tree but I said I didn’t think I wanted to do the fireplace tools and the cat. I ended up doing this in pieces so that I could make it pleasing to me. The tree, trucks, basic fireplace and wreath are one drawing. I included the fireplace tools in this drawing but planned to cut it off of the paper if I hated it. The TV is one drawing. It was actually the TV I had at the time. I drew a number of sleeping cats until I got one I liked and then cut it with an xacto knife and glued it over the fireplace. The clock had belonged to my grandmother. She had bought a house in the Bronx in the early sixties and there were two old Seth Thomas clocks in the cellar. She gave me the more beat up one to try to fix but, of course, I managed, if anything, to make it more broke than it was. My mother eventually had a colleague who collected clocks take a look at the other one and he got it working for her. She eventually gave it to me and Gerry as an anniversary gift. I couldn’t stand the loud ticking so I never wound it after it ran down. I then put it all together on the scanner and did a high resolution scan. I drew the stockings on the computer along with their nails and then layered them over the fireplace. I printed one copy of the end result on watercolor paper, signed it, and declared it to be the original. Some years later I made a version with just one stocking with the name Ernie on it and gave a print to Ernie Anastos when he went back to CBS from Channel 9. I eventually had a hard drive crash and lost all the pieces except for this scan from the card that the client had printed.